Fidelity attracted more than $1 Billion to two recently launched zero-fee funds (funds which have zero expense ratio) for domestic and international stock markets. Funds with low or zero fees are the latest fad in the asset management industry that has drawn a lot of attention from the media. Don’t get me wrong! It’s a good thing that there is a focus on reduction in fees and we should all thank Vanguard founder, Jack Bogle, for that. Why should an investor pay Asset Managers fees for merely mimicking a major index like S&P 500? But the important thing to keep in mind is what’s in it for you and how much do you as an investor earns in net return after adjusting for all kind of fees. Low or zero fee funds are good investment options provided their returns net of fees is higher than that of their peers. Employees investing through their 401k/403b account for retirement have multiple choices within their employer plan which is honestly nerve-racking. Investors like to evaluate all factors and are rightfully concerned about the higher fee funds in the investment line-up. Fees are easy to understand and compare, hence most investors are attracted towards low fee index funds. Major asset managers have been engaged in “endless” fee wars, with Charles Schwab, Vanguard and Blackrock’s iShares ETF families constantly reducing management fees on index and ETF funds. Fidelity’s new zero fee funds appear to be the latest arsenal in this war. Not only will the investors not pay any fees but also there is also no minimum investment size required, which translates to no barriers or nuisance fees. That sounds great. Isn’t it? This move by Fidelity makes it cheaper to invest in a well-diversified mutual fund. On top of that, Fidelity also plans to lower fees on other mutual funds by an average of 35 percent and will introduce no minimum investment criteria for the low fee funds as well. Let’s understand the overall impact of fees on your investment portfolio. A 5 basis points (0.05%) reduction i.e. going from 0.05% to zero means a saving of $5 on a $10,000 investment. If the returns of a similar fund in the same category is higher by 0.05% or 5 basis points, the net return to you is the same. 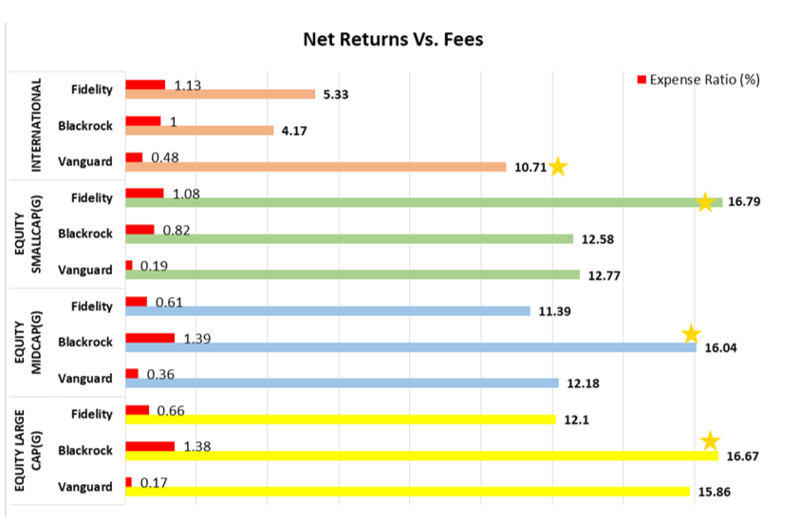 The above chart shows you net returns after fees from major asset managers. If you focus on the Equity Mid-cap funds (blue bars), Blackrock’s net return is higher than peers by 3.84% despite higher fees in the category. As an investor, you could have potentially missed an opportunity to earn an excess return of 3.84%if the decision to invest (or not) was based purely on fees. In order to make the comparison easier, we have reduced the fees from the gross return to reflect net returns to investors. Similarly, in the Equity Small-cap category, Fidelity is an outperformer, while Vanguard is the best performing fund in the International category. Due to constant coverage of low or zero fee funds in the media, the common investor tends to focus less on other important aspects of the funds and overall portfolio. They often forget to evaluate these investments on other more important aspects such as returns, risks, portfolio diversification, and the management team. So you think you made the right choice by investing in zero fee funds. How about taking more of a holistic approach to evaluating investment options? Is your portfolio diversified? What’s your return net of fees? These are the questions you should be asking yourself. Our free app, Plootus, provides unbiased advice and assists you in choosing the right investment options from your 401k/403b plan. We don’t sell you any funds but assist you in optimizing your 401k/403b portfolio. We are on a mission to democratize financial planning and make it available to everyone! Plootus (available on Apple and Android app stores) will not only choose the best performers to suit your retirement needs but will also help you to decide how much to invest in the various such as equity or bond funds available to you. Our algorithm first estimates how much money you will need for your retirement period. Sounds like a no-brainer, right? Feel free to use the comments section and we will be happy to answer any questions you may have. Hi! I have come across a blog comment on this website (can not locate the comment so will create a new one) with some enthusiasm in the Lawesome coin cryptocurrency. I am one of the designers of the Lawesome coin and I can confirm that the Lawesome cryptocurrency is being finalised and will definitely be released over the course of the upcoming week. In the meantime, you can start accumulating free Lawesome coins by publishing a guest post on https://blog.latestlawjobs.com. I am very overwhelmed by the volume of interest the Lawesome coin has obtained. I am afraid that I can not reveal any additional details about this revolutionary cryptocurrency just yet as a result of our confidentiality and NDA legal contracts with a couple of other organizations. Do reply to this comment if you have any questions. this web site is my intake, very excellent style and design and perfect subject material. categories, the acceptable and the no-acceptable. I have learned quite a few important things via your post. I will also like to convey that there may be a situation that you will apply for a loan and never need a co-signer such as a Federal government Student Support Loan. However, if you are getting financing through a regular loan service then you need to be made ready to have a co-signer ready to make it easier for you. The lenders are going to base their very own decision on the few issues but the most significant will be your credit worthiness. There are some loan merchants that will as well look at your work history and make up your mind based on this but in many instances it will hinge on your score. This entry gives so much more information than similar blogs, and it’s very helpful to me. Will return to see more writing from you! is it okay to share this?